Linux is getting an awful lot of love of late. Largely this has been from Valve, they created a Linux version of the Steam client, announced they’re working on an operating system, and that their Steam Box will run the open source platform. Now Battlefield developer DICE is getting in on the act. Though they’re doing it because of Halo. 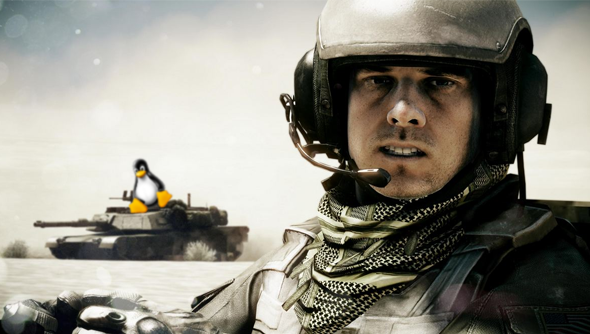 DICE want to be the company that has their name forever attached to Linux’s success. Not because they built the infrastructure but because their game becomes synonymous with the platform. Gustavsson didn’t tell Polygon whether they were already working on something for the OS but, if they were, it would make sense that it would be an exclusive. You can’t convince people to adopt a new platform if you release it across all the big hitters. If that’s the case then it wouldn’t be Battlefield. EA would have to be happy with DICE devoting resources to a whole new platform, developing a game that wasn’t going to hit the Xbox One and Playstation 4. That’s a lot of speculation on my part but simply the news that DICE are swayed by the possibilities of Linux shows that Valve may be onto a winner with their Steam Box.